He can waddle down on a dee, but he can't scarf a Scarfy! He breathes it in, he spits it out. Bright pink and with an eating problem. No, it's not me, it's Kirby! And right back at 'ya, it's another rehashed adventure starring the pink puffer. Nightmare in Dreamland is an enhanced (or should we say, "advanced", oh ho ho) remake of the original Kirby's Adventure for the NES. Little new has been added, and few major changes have been implemented, but ultimately we're looking at the classic game spruced up for the GameBoy Advance. New multiplayer features, new modes, and updated graphics. The story isn't really relevant, but let's go over it. Kirby's having a nice well-earned nap after terrorizing the citizens of planet Popstar with his endless stomach, but for some mad reason he is unable to dream. He heads to the "Fountain of Dreams", the source of all dreams in Dreamland, to see what's the matter. He finds a fat ugly penguin bathing in the fountain. Yes, that really happens. The penguin, King Dedede, shattered the "Star Rod" (which powered the fountain) into seven pieces and gave each of his six friends a part and keeping one for himself. In predictable Kirby fashion, King Dedede and his buddies were actually protecting Dreamland from the vicious Nightmare, who wishes to corrupt everybody's dreams and turn them into re-runs of Zoom. Kirby pieces the Star Rod back together and uses it to face off against Nightmare, bring an end to his tyranny, and ensure that the freedom to dream anything you like is returned to the citizens of Dreamland. But Kirby probably doesn't forgive Dedede because he's a pink spherical jerk. The goal is to meander through each stage, reach the boss, and lay waste to them in order to nab a piece of the Star Rod. 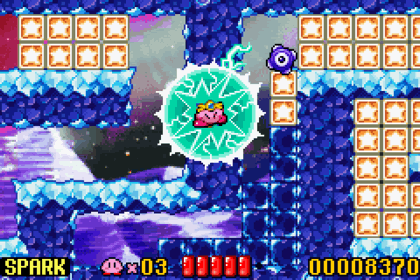 Kirby can inhale enemies and swallow them in order to obtain their skills and abilities, which can be then used to make the traversal of the unusual geography of Dreamland a little easier. Some enemies don't have powers, so you pick up very quickly on which enemies will offer which traits. There are 24 abilities in the game — technically 25, but the very last power is the Star Rod which can only be used during the final boss battles. Each stage has a colour theme, indicated by its alliterative name. Butter Building is Blue, Vegetable Valley is Violet, Grape Garden is Green, etc. The level names, when placed in reverse order also spell out the acronym ROYGBIV, the list of colours in the typical rainbow. 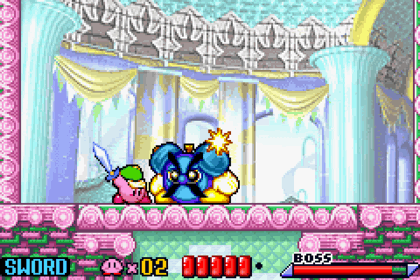 Kirby's Adventure and this GBA port are filled with little oddities such as this. For example, at the end of each stage, you can try to get an extra life by launching Kirby as high as possible. But if you launch him to each height in order over the course of seven stages, you'll be awarded with thirty lives. Draw a circle, add two dot eyes, and a big smile... Hey, presto, it's Emoji! The soundtrack is gorgeous by Game Boy Advance standards. The instruments chosen fit the game rather well and are bouncy and lively, just like the theme of the game. I'd have preferred the NES version soundtrack over this, but that's only because I've got a strange passion for the 8-bit bleeps and bloops of the old Famicom. The designs implemented in Kirby: Nightmare In Dreamland were later re-used wholesale for the animated series. In many ways, this game was the "re-imagining" of Kirby and the starting point for future Kirby games to look back on. The vastly superior open-world game, Kirby and the Amazing Mirror, was built entirely off the backend of Nightmare In Dreamland, and future games used the style introduced in the game. After beating the game's hidden Extra mode (which reduces your vitality and ups the difficulty), you can play through the game as the antagonist Meta Knight, in "Meta Knightmare!" mode. There are multiplayer minigames that can be played via link cable, an arena where you can fight each of the game's bosses one after another, and plenty of hidden areas tucked away with harder routes and bigger bonuses. 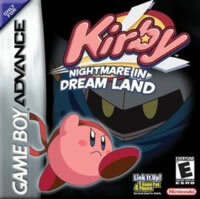 Nightmare in Dreamland is a very strong entry in the Kirby series and the springboard for countless other games. The difficulty is non-existent (I had 25 lives when I defeated the final boss), but the extra modes add much needed replay value and challenge. I would honestly recommend Amazing Mirror over this no matter what, but Nightmare is certainly a fun and enjoyable entry in the Kirby series.